For another plant called myrrh see cicely; for the record label see Myrrh Records. 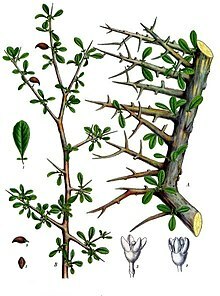 Myrrh (/mɜːr/; from Aramaic, but see § Etymology) is a natural gum or resin extracted from a number of small, thorny tree species of the genus Commiphora. Myrrh resin has been used throughout history as a perfume, incense, and medicine. Myrrh mixed with wine can also be ingested. When a tree’s wound penetrates through the bark and into the sapwood, the tree bleeds a resin. Myrrh gum, like frankincense, is such a resin. When people harvest myrrh, they wound the trees repeatedly to bleed them of the gum. Myrrh gum is waxy and coagulates quickly. After the harvest, the gum becomes hard and glossy. The gum is yellowish and may be either clear or opaque. It darkens deeply as it ages, and white streaks emerge. Myrrh gum is commonly harvested from the species Commiphora myrrha. Another commonly used name, Commiphora molmol, is now considered a synonym of Commiphora myrrha. Commiphora myrrha is native to Somalia, Oman, Yemen, Eritrea, (Somali Region) of Ethiopia and parts of Saudi Arabia. Meetiga, the trade-name of Arabian Myrrh, is more brittle and gummy than the Somali variety and does not have the latter’s white markings. 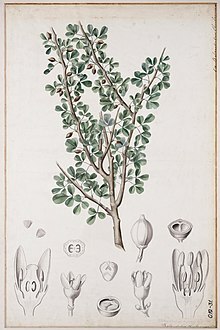 The oleo gum resins of a number of other Commiphora species are also used as perfumes, medicines (such as aromatic wound dressings), and incense ingredients. 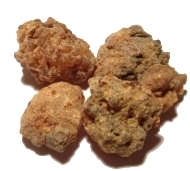 These myrrh-like resins are known as opopanax, balsam, bdellium, guggul bisabol, and Indian myrrh. Liquid myrrh, or stacte, written about by Pliny, was an ingredient of Jewish holy incense, and was formerly greatly valued but cannot now be identified in today’s markets. The word myrrh corresponds with a common Semitic root m-r-r meaning “bitter”, as in Aramaic ܡܪܝܪܐ murr and Arabic مُرّ murr. Its name entered the English language from the Hebrew Bible, where it is called מור mor, and later as a Semitic loanword was used in the Greek myth of Myrrha, and later in the Septuagint; in the Ancient Greek language, the related word μῠ́ρον (múron) became a general term for perfume. 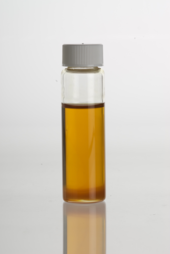 In pharmacy, myrrh is used as an antiseptic in mouthwashes, gargles, and toothpastes. It is also used in some liniments and healing salves that may be applied to abrasions and other minor skin ailments. Myrrh has been used as an analgesic for toothaches and can be used in liniment for bruises, aches, and sprains. A related species, called guggul in Ayurvedic medicine, is considered one of the best substances for the treatment of circulatory problems, nervous system disorders, and rheumatic complaints. The 5th dynasty ruler of Egypt King Sahure recorded the earliest attested expedition to the land of Punt, modern day Horn of Africa particularly Somalia which brought back large quantities of myrrh, frankincense, malachite and electrum. Other products that were also brought back included wild animals, particularly cheetahs, the secretary bird (Sagittarius serpentarius), giraffes and Hamadryas baboons (which was sacred to the Ancient Egyptians), ebony, ivory and animal skins. Sahure is shown celebrating the success of this venture in a relief from his mortuary temple which shows him tending a myrrh tree in the garden of his palace named “Sahure’s splendor soars up to heaven“. This relief is the only one in Egyptian art depicting a king gardening. Myrrh was used by the ancient Egyptians, along with natron, for the embalming of mummies. Myrrh is mentioned as a rare perfume in several places in the Hebrew Bible. In Genesis 37:25, the Ishmaelite traders to whom Jacob‘s sons sold their brother Joseph had “camels … loaded with spices, balm, and myrrh,” and Exodus 30:23-25 specifies that Moses was to use 500 shekels of liquid myrrh as a core ingredient of the sacred anointing oil. Myrrh was an ingredient of Ketoret: the consecrated incense used in the First and Second Temples at Jerusalem, as described in the Hebrew Bible and Talmud. An offering was made of the Ketoret on a special incense altar and was an important component of the temple service. 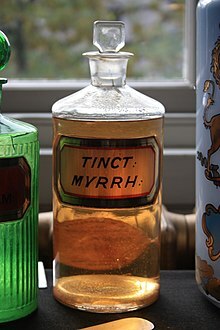 Myrrh is also listed as an ingredient in the holy anointing oil used to anoint the tabernacle, high priests and kings. Now when every maid’s turn was come to go in to king Ahasuerus, after that she had been twelve months, according to the manner of the women, (for so were the days of their purifications accomplished, to wit, six months with oil of myrrh, and six months with sweet odours, and with other things for the purifying of the women). Myrrh was recorded in the first century BC by Diodorus Siculus to have been traded overland and by sea via Nabatean caravans and sea ports, which transported it from indigenous Ethiopian sources in Southern Arabia to their capital city of Petra, from which it was distributed throughout the Mediterranean region..
Myrrh is mentioned in the New Testament as one of the three gifts (with gold and frankincense) that the magi “from the East” presented to the Christ Child (Matthew 2:11). 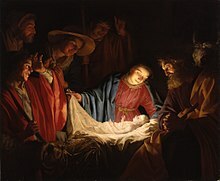 Myrrh was also present at Jesus’ death and burial. Jesus was offered wine and myrrh before the crucifixion (Mark 15:23). According to John’s Gospel, Nicodemus and Joseph of Arimathea brought a 100-pound mixture of myrrh and aloes to wrap Jesus’ body (John 19:39). The Gospel of Matthew relates that as Jesus went to the cross, he was given vinegar to drink mingled with gall: and when he had tasted thereof, he would not drink (Matthew 27:34); the Gospel of Mark describes the drink as wine mingled with myrrh (Mark 15:23). Because of its mention in the New Testament, myrrh is an incense offered during some Christian liturgical celebrations (see Thurible). Liquid myrrh is sometimes added to egg tempera in the making of icons. Myrrh is mixed with frankincense and sometimes more scents and is used in almost every service of the Eastern Orthodox, Oriental Orthodox, traditional Roman Catholic, and Anglican/Episcopal churches. Myrrh is also used to prepare the sacramental chrism used by many churches of both Eastern and Western rites. In the Middle East, the Eastern Orthodox Church traditionally uses oil scented with myrrh (and other fragrances) to perform the sacrament of chrismation, which is commonly referred to as “receiving the Chrism“. Modern myrrh has long been commented on as coming from a different source to that held in high regard by the ancients, having been superior in some way. Pedanius Dioscorides described the myrrh of the first century AD as most likely to refer to a “species of mimosa“, describing it “like the Egyptian thorn“. He describes its appearance and leaf structure as “pinnate-winged”. The ancient type of myrrh conjectured was noted for possessing a far more delightful odor than the modern. ^ The Plant List. 2013. Version 1.1. Published on the Internet: http://www.theplantlist.org/. Accessed on February 24, 2014. ^ “Species Information”. www.worldagroforestrycentre.org. Archived from the original on 2011-09-30. Retrieved 2009-01-15. ^ Al Faraj, S (2005). “Antagonism of the anticoagulant effect of warfarin caused by the use of Commiphora molmol as a herbal medication: A case report”. Annals of Tropical Medicine and Parasitology. 99 (2): 219–20. doi:10.1179/136485905X17434. PMID 15814041. ^ Fritze, Ronald H. “New worlds: The great voyages of discovery 1400-1600”. Sutton Publishing Limited, 2002, p. 25. ^ Morrow, Joh A. “Encyclopedia of Islamic Herbal Medicine”. Jefferson, N.C.: McFarland, 2011, p. 145. Massoud A, El Sisi S, Salama O, Massoud A (2001). “Preliminary study of therapeutic efficacy of a new fasciolicidal drug derived from Commiphora molmol (myrrh)”. Am J Trop Med Hyg. 65 (2): 96–99. PMID 11508399. Dalby, Andrew (2000). Dangerous Tastes: the story of spices. London: British Museum Press. ISBN 978-0-7141-2720-0. (US ISBN 0-520-22789-1), pp. 107–122. The One Earth Herbal Sourcebook: Everything You Need to Know About Chinese, Western, and Ayurvedic Herbal Treatments by Ph.D., A.H.G., D.Ay, Alan Keith Tillotson, O.M.D., L.Ac., Nai-shing Hu Tillotson, and M.D., Robert Abel Jr.
Abdul-Ghani, RA; Loutfy, N; Hassan, A (2009). “Myrrh and trematodoses in Egypt: An overview of safety, efficacy and effectiveness profiles”. Parasitology International. 58 (3): 210–4. doi:10.1016/j.parint.2009.04.006. PMID 19446652. ( A good review on its antiparasitic activities) .